I have never been one to go crazy over brownies because I found them too sweet or chocolaty to my liking. 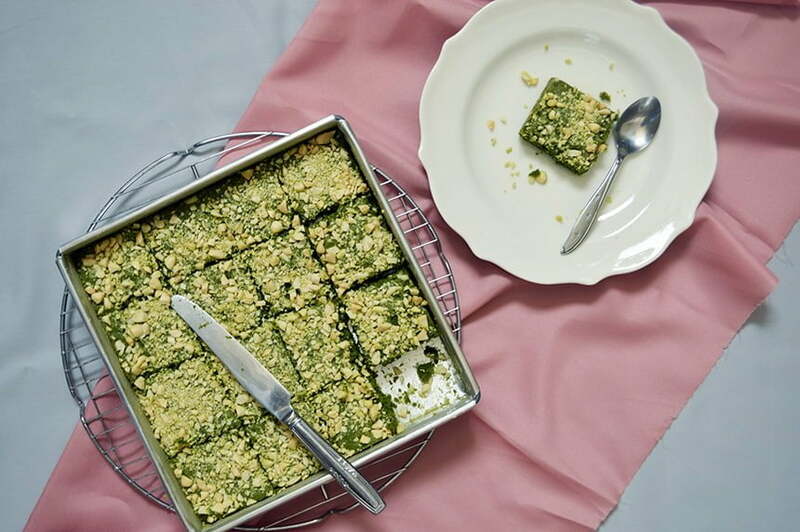 So, I wanted to try something different this time by incorporating my favorite matcha into the classic baked treats. Adding matcha powder seriously took white chocolate brownies to the next level. These Matcha White Chocolate Brownies are fudgy and moist, with earthy and bitter matcha flavor that does not overwhelm the sweetness from white chocolate. I also scattered crushed almonds on top for added texture for every bites. Some of you may get confused about the difference of green tea and matcha. Don’t confuse matcha with the same green tea that you drink at home or Japanese restaurants. The names are slightly deceptive, because green tea and matcha are used interchangeably, but they are actually slightly different. Matcha and green tea both come from the same plant, camellia sinensis, but they are grown and processed differently. Matcha is made from whole green tea leaves that have been pulverized into a super fine powder. Because the whole leaf is powdered and ingested, instead of just water infused through the tea leaves, matcha has significantly greater substances and deeper flavor than green tea. Moreover, you cannot grind the regular green tea to make matcha, considering matcha is made from shade-grown tea leaves. Processing regular green tea involves the leaves being left in the sun. Comparatively, matcha bushes are spesifically kept under cover to increase the chlorophyll and amino acid level in the leaves. That is why matcha has a much richer flavor than green tea. Please note that matcha comes in both ceremonial-grade and culinary-grade. Ceremonial-grade is considered higher quality and should be used for drinking. Meanwhile, the culinary-grade powder is intended for baking and cooking purposes. As much as you want to speed the process along, wait a few minutes before mixing the hot melted chocolate with the eggs. Otherwise, you might run the risk of cooking and scrambling the eggs. Please note that there are many various matcha brands that come in all shapes and sizes, with different aromas, textures, and shades of green. Therefor, each different brands may suggest in different ratios of matcha into your baked goods. I found 3 tablespoons of matcha powder is sufficient for strong matcha taste in this recipe. If you want to get something with less bitter and lighter color, just add 1-2 tablespoons of matcha. If you like it stronger, feel free to add more matcha, but keep in mind that matcha by itself is very concentrated and you usually do not need to use a lot. For added texture, I sprinkle roughly chopped almonds on top of the batter. You can alternatively add some of your favorite additions like white chocolate chips, cherries, walnuts, and many more. I know that the smell of fresh-baked brownies just pulled from the oven is beyond amazing. However, giving your brownies ample time to cool will make for a nicer and cleaner cut. But more importantly, once they had time to set for an hour or two, the flavor will be more developed and taste even better than when they first came out of the oven. These Matcha White Chocolate Brownies are fudgy and moist, with earthy and bitter matcha flavor that does not overwhelm the sweetness from white chocolate. Preheat oven to 350F / 180°C. Grease and flour an 8x8-inch / 20x20cm square pan. Set aside. Whisk in the eggs and vanilla extract until well combined. Whisk in sugar and sifted all purpose flour, matcha powder, baking powder, and salt until well combined. Pour and spread the batter evenly into the prepared pan. Sprinkle with chopped almonds on the top. Bake for 20 minutes or until a toothpick inserted in the center comes out clean. Cool completely before slicing.